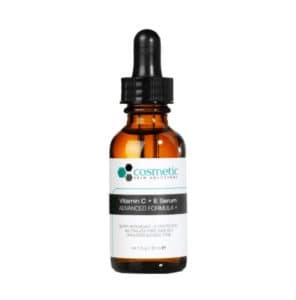 We know it’s hard to believe, but Cosmetic Skin Solutions Vitamin C + E Serum is as effective as it is affordable, especially when compared to… ahem… certain competitors. The formula contains a powerful mix of 15% Ascorbic Acid (Vitamin C), 1% Alpha Tocophorol (Vitamin E), and 0.5% Ferulic Acid. When combined – as research indicates – each individual ingredients benefits is maximized, helping to even out skin tone and increase collagen production. The formula even includes hyulurunic acid to increase moisture retention, acting like a skincare Captain Planet and leaving skin firm, plumped, and brightened. If you’re interested in learning more explore our guide on the best vitamins for your skin.